PatchPanel: Play Music, or Spotify? 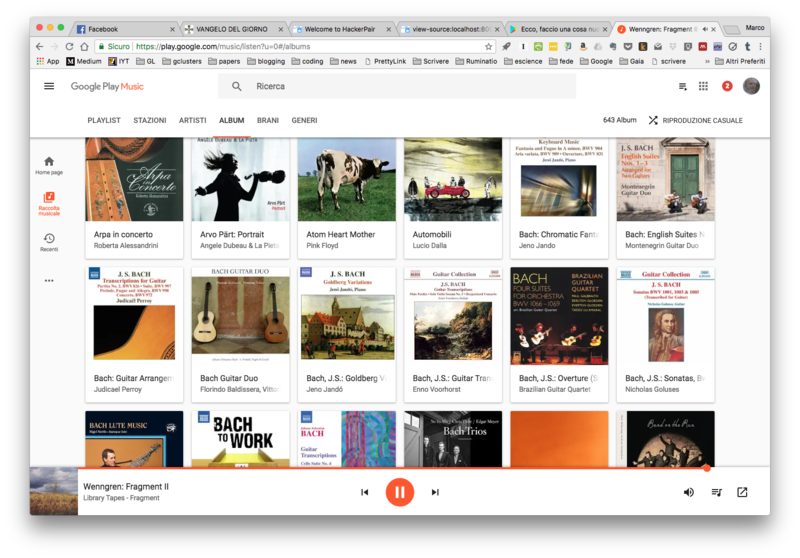 There is a thing I like so much in Google Play Music, and it's the simple beauty of its minimalistic interface. Really much more appealing, to my eyes, in respect (just do say) to the look of Spotify. Nothing to say, Google is still the best, when dealing with style. Notwithstanding, I find that Play Music do suffer of several limitation, in comparison with a service like Spotify. I'm not talking about the dimension of its musical archive (all these service do have huge archives nowadays), but of some annoying limitation that you can experience when you use it on a daily basis. First of all, you cannot sort your collection in any way. In other words, there is no way to alter the default order, in which all your album area listed alphabetically. Spotify (and I guess, many others) give you the freedom to order your collection in a number of different ways: for example, I find very useful to inspect my collection ordering it by the most recents additions, since it's a simply way to understand what happened recently to your albums, and to recall you something about your more recent tastes. On Play Music, whenever you add an album, it disappears instantly inside your (huge) collection, so you have to search it patiently among a lot of albums. That's annoying, for sure. Oh, and I have told you something about searching, by the way? Why on Google it's not possible to delimitate a given search inside your collection? Sometimes, you do not have time to browse the whole musical achievements of the humankind, you simply want to recover that specific album from your collection. 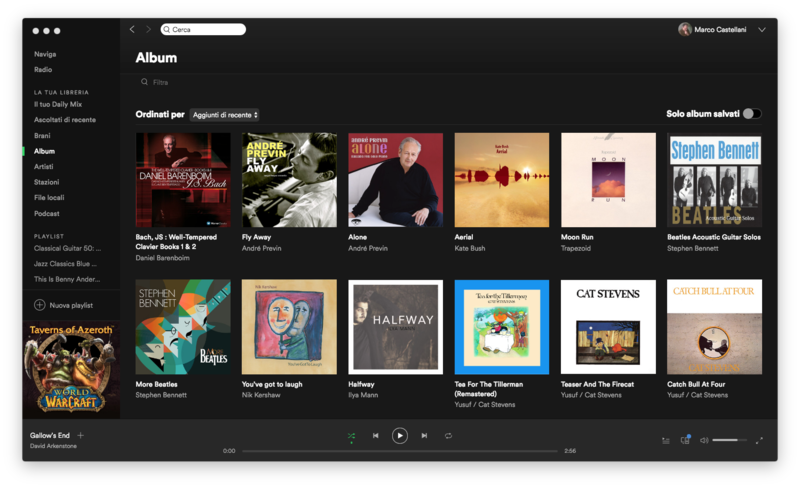 Spotify interface. Why only black? Turns out, doing it on Play Music it's not as simple as you may guess. Yes, on Spotify you can make a search inside your library, neglecting all the rest of the (musical) word. Exactly as you should do with your (ancient, outdated) collection of CDs, or (more recently) with your collection of mp3 files. That's why the beauty of the interface, all considered, it's not enough for the adoption of one service over the other. That's why, exactly. So I'm using Spotify right now. But I can't help but looking to the page of Play Music, from time to time. How simply beautiful it may appear! Beauty is not all, in this word.